Many of us have either finished our exams or they are coming to an end. The question I want to ask you today is: what does it mean to be joyful? The last couple of months have shown me the reality of what it means to be joyful as well as have joy in the Holy Spirit. Exam season can be mentally and physically exhausting. The irony is, a couple weeks before our exams begin, many take their Bibles off the shelf, dust them off, and prepare to pray for favour and prosperity. But in reality, our hearts are dwelling in the absence of joy. Whilst trying to seek motivation, strength, intelligence and understanding, we fail to see what we are really missing. Often we seek happiness, joy and satisfaction in all the wrong places. To be joyful does not mean to have it all together. It does not depend on how amazing your current situation is. Joy is not associated with your physical or emotional state. So if Joy does not depend on the situation you're in, or the emotions you're feeling, what does it depend on? It depends on the Holy Spirit. I'm writing to you today to briefly express what it means to bare such a wonderful fruit of the Holy Spirit, joy. Just like any fruit, it cannot grow without some sort of sowing of seeds involved. In other words, you will never find Joy if you do not actively peruse it. Furthermore, you will never find it if the Joy you are perusing is not authentic. To "peruse joy" doesn't mean to smile wherever you go. To rejoice throughout the storm is very different to smiling through the pain. I've always been told to be joyful, but why? How can I just smile when I know I've got 7 different lecture slides to go through 2 days before my exam; it doesn't even remotely make any sense. Furthermore, it so absurd that alot of us are under the illusion that being joyful means pretending like you're happy even though your life seems to be going south. Took me a little while to realise that there is one thing that is consistent throughout my happiness and my sadness; and that is Christ Jesus. Rejoice in the Lord always... (Phillipians 4:4) This may seem like a terribly simplistic solution but that's the beauty of it. In every scenario, rejoice in the Lord. Don't smile for the sake of it. Smile because Christ has given us the opportunity to bare the fruit of the Spirit. 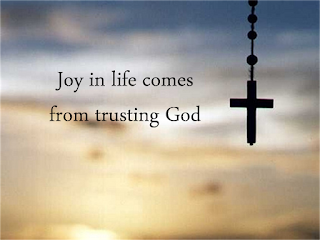 Joy is not just having a positive attitude and a smile on your face; but Godly joy has meaning behind it. Why smile for the sake of it when you can have a reason to? Understand that you have the Spirit of the living God within you, through Christ; and I guarantee that whatever the situation you're in, this very fact will keep joy in your heart and peace in your mind. It takes trust to have joy in the Lord. with joy comes peace, patience, kindness and faithfulness.